On the heels of MTV closing out its third consecutive quarter of prime growth – the fastest growing cable network – scored its highest rated series debut on Live+3 with "Jersey Shore Family Vacation." Further cementing its dominance, "Jersey Shore Family Vacation" was the most watched unscripted debut on cable since 2012 on both LSD and Live+3. After reaching a cable milestone with the LSD premiere, MTV cracked a 4.2 average rating in its core demo of P18-34 in Live+3. The LSD P18-34 rating grew an impressive 43% with three additional days of playback which increased total viewers by one million, to 3.6 million overall. Across all plays in its premiere weekend, "Jersey Shore Family Vacation" reached nearly 10 million total unique viewers. The "Shore" franchise is an MTV worldwide phenomenon that features such hits as "MTV Floribama Shore" currently shooting its second season, "Geordie Shore" in the UK, "Gandia Shore" in Spain, "Warsaw Shore" in Poland, "Acapulco Shore" in Mexico and "Super Shore." 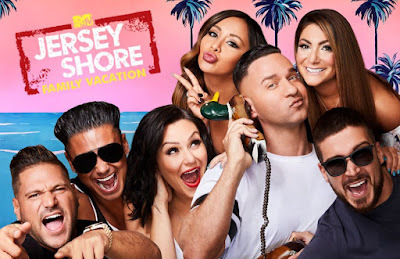 "Jersey Shore Family Vacation" features original housemates Deena Nicole Cortese, Paul "Pauly D" Delvecchio," Jenni "JWOWW" Farley, Vinny Guadagnino, Ronnie Ortiz-Magro, Nicole "Snooki" Polizzi and Mike "The Situation" Sorrentino who reunite in Miami for the vacation of a lifetime. Source: Nielsen data; highest rated series premiere on MTV based on L3/P18-34 coverage ratings, excludes tentpole days; best unscripted cable debut based on L3/P18-34 impressions across ad supported cable, new series premiere telecast; nearly 10 million viewers claim based on total viewer P2+ reach 000s/6 min qual—across all premiere/repeat telecasts of JSFV on MTV from 4/5-4/8—L3 for 4/5, LSD for 4/6-4/8; fastest growing cable net- among top 50 cable nets, based on L3/P18-34 prime (M-Su/8p-11p) impressions from 6/26/17-4/1/18, all nets growth based on YoY L3/P18-34 coverage ratings from 6/26/17-4/1/18 vs. 6/27/16-3/26/17.